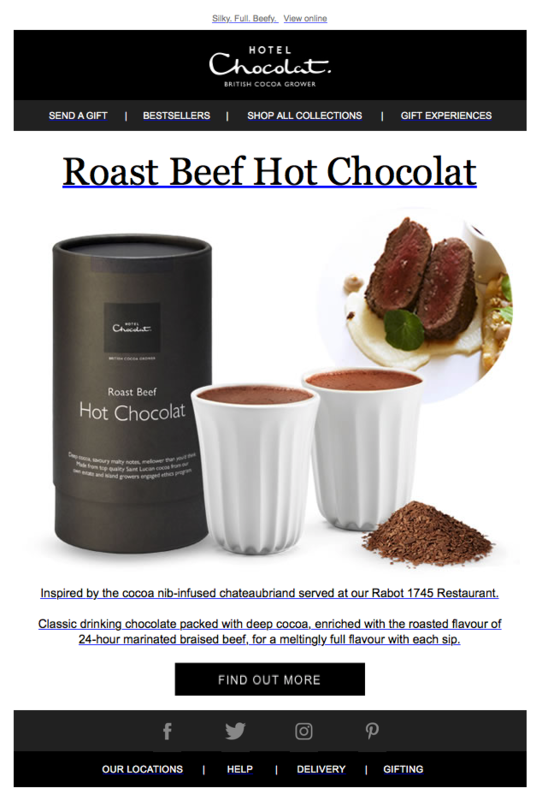 Subscribe free to our quarterly food retail trend reports for marketers + ideas, views, insight and new creative to inspire. 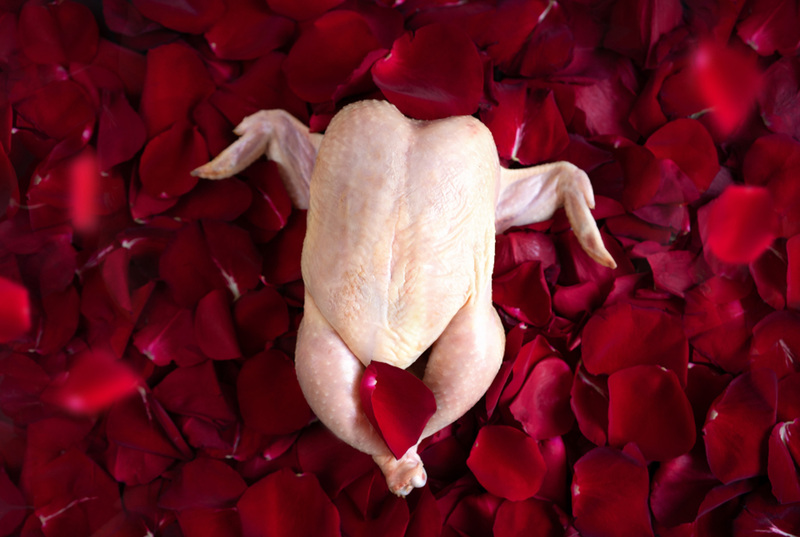 April Fool’s Day, the day of the year where brands can have a bit of fun with their marketing! With social media making it so easy to create a campaign and the cost being low, brands would be fools (see what I did there?) not to create a cheeky campaign to have a bit of fun with their customers and build some brand awareness at the same time. Dipping your fries in your McDonalds milkshake has long been the marmite of the McDonald’s world, with some treating it as a delicacy and others thinking it is disgusting. 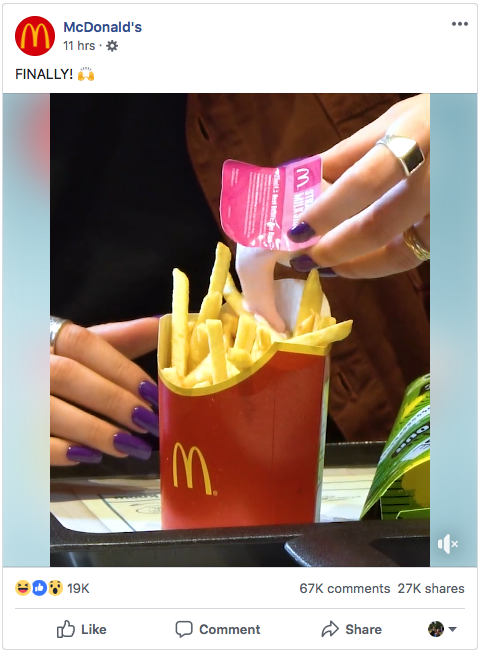 Well, the fast food chain has decided to use this fierce debate to their advantage and have created Milkshake dipping sauces. This has caused quite the stir with huge numbers of comments and shares, although I think some customers are quite disappointed this is a joke. The age-old debate… Orange juice with or without bits?! 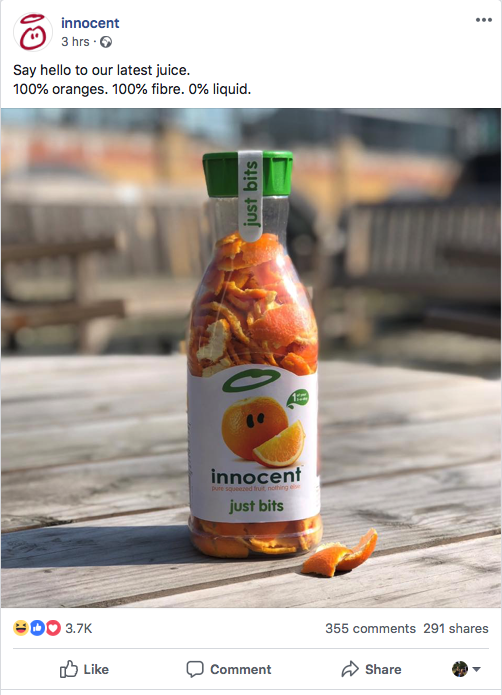 Well Innocent have taken this one step further, unveiling their new ‘just bits’ orange juice with 0% liquid. Innocent are the kings of tongue in cheek marketing campaigns and a big favourite of mine for proof of how effective a fun digital campaign can be! 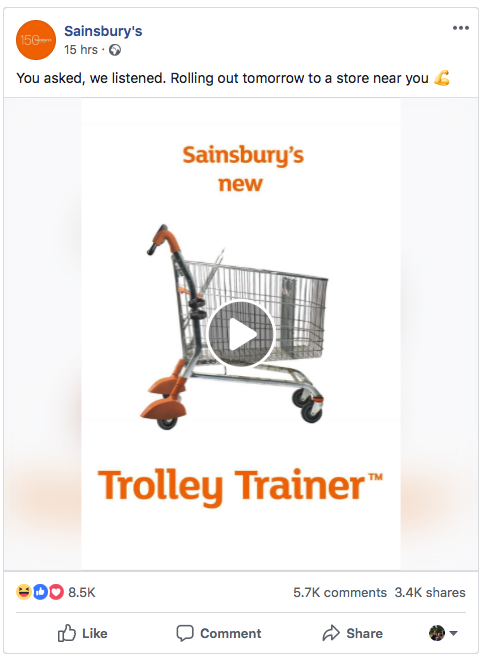 It’s here… The moment we have been waiting for, Sainsbury’s have released their new ‘trolley trainer’. With 10 resistance levels, a heart rate monitor, calorie counter and bottle holder. You can work your body while you push the trolley! Although, the weekly shop is already a workout, so I’m not sure how necessary this would be. Sainsbury’s even went to the effort of creating a video, telling you all the features of the trolley – check it out on their Facebook page! 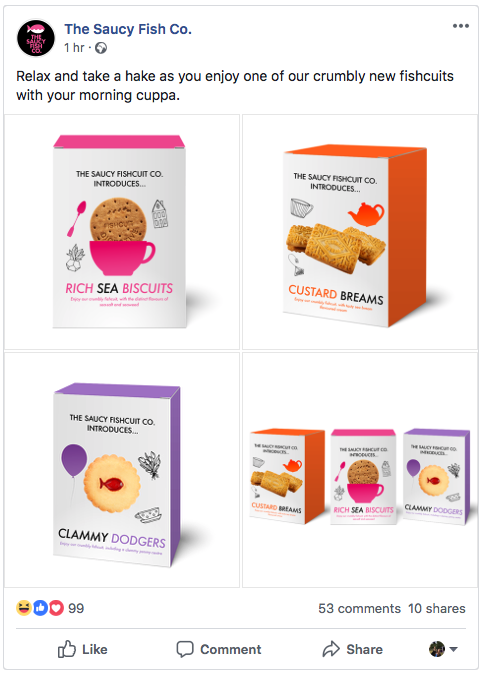 Who wouldn’t want to dip a rich sea biscuit or a clammy dodger into their morning cuppa? I know what you’re thinking “where have these been all my life? !” Well The Saucy Fish Co. are here to answer your prayers with their new ‘fishcuits’. Such a simple idea but executed so well, this post has a lot more interaction than all of the others on their Facebook page, they also teased this for a couple of days running up to the 1st April, making the most of the occasion. 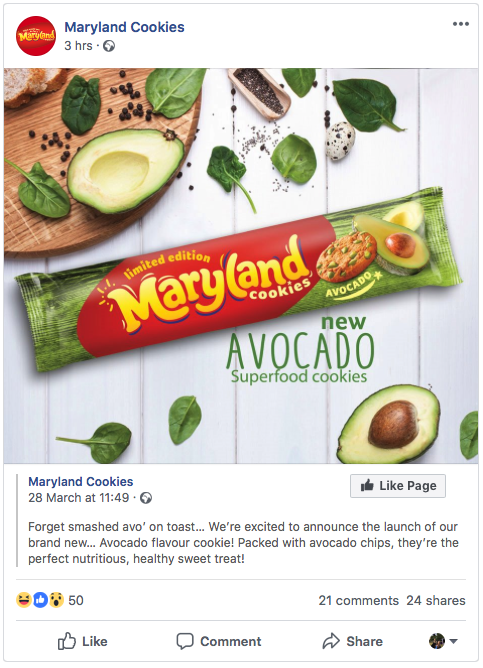 The answer to every millennial’s dreams, Avocado Maryland biscuits, replacing the chocolate chunks with pieces of avocado a healthy twist on the family favourite. Even creating a nice bit of artwork for this joke, Maryland tried their best to fool their customers. Is it wrong that I really want to try these? Nestle have invested in years of intense research in order to develop and launch their KITKAT tea – perfect for when you take a break with your KITKAT. They even released a video, teaching their customers how to make the perfect brew with the tea bags. 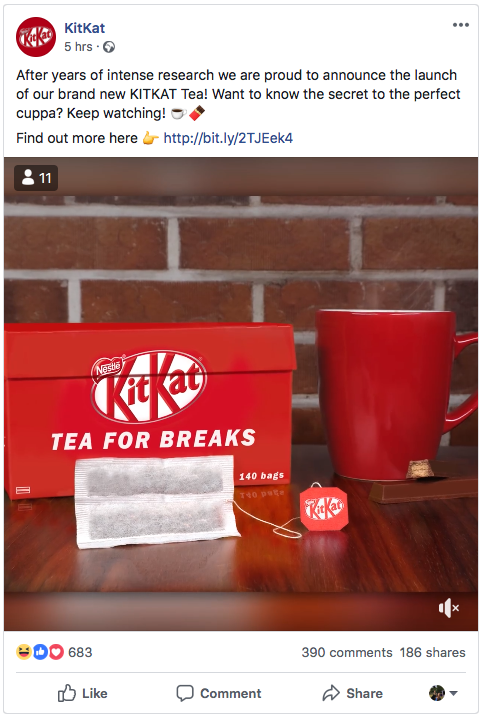 Again, KITKAT showed dedication to their joke, continuing to insist this is a real product and having some fun with their customers! 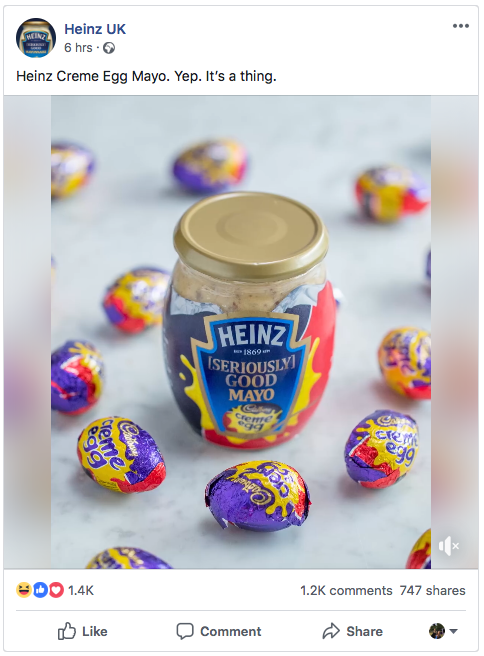 I can’t lie, this one made me feel a little bit sick… Heinz have collaborated with Cadbury’s to create Crème Egg mayo. Some are describing it as ‘Nutella but better’ I’m not sure I agree. Strongbow, known by many to be the official drink of lads! 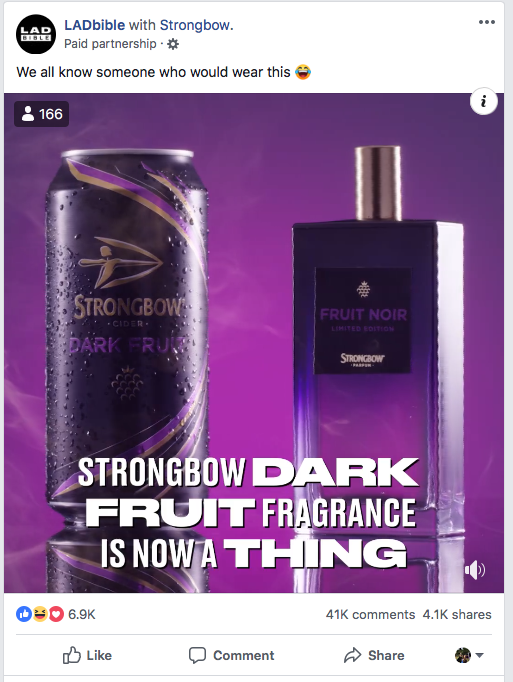 It seems only right that they teamed up with ‘Lad Bible’ on Facebook to release the Darkfruit fragrance, named ‘Fruit Noir’ so you can smell just like you’ve spilt a pint of cider down yourself! Whatever you think of April Fool’s Day, it just goes to show how brands work now, using any national day to promote their brand and to build relations with their customers. With the use of social media calendars they can now plan far in advance meaning that these pranks become more elaborate each year. These posts tend to get a lot more interaction from customers than the standard posts, showing just how effective a tongue in cheek campaign can be. I can’t wait to see what April 1st brings next year, no doubt the marketing teams will be planning for it soon!